Are coyotes defined as furbearer, game animal, or other in Alabama? The following are designated as game animals in Alabama: bear, beaver, coyote, deer, fox, opossum, wild rabbit, raccoon, squirrel, nutria, mountain lion (cougar), red wolf, groundhog, bobcat and feral swine (wild hog). Do you need a license to hunt coyotes in Alabama? Yes. Can a non-resident hunt coyotes in Alabama? Yes with a valid hunting license. Is there a specific hunting season for coyotes in Alabama? No Closed Season. Is there a bag limit for coyotes in Alabama? No Bag Limit. What are the legal hunting hours for coyotes in Alabama? Legal hours for hunting except as noted for migratory birds, waterfowl, raccoons and opossum are now defined as 30 minutes before sunrise until 30 minutes after sunset. Are electronic game calls legal in Alabama? Electronic calls may be used to call predators during daylight hours only during open hunting season for that species. Are decoys legal for coyotes in Alabama? Yes. What firearms are approved/disapproved for coyotes in Alabama? For fox, coyote and feral swine: Rifles of any caliber; handguns or pistols; shotguns, 10 gauge or smaller (with slugs or single round ball only during stalk gun deer season); long bows, compound bows, or crossbows. Spear or sharpened blade. These are all approved. It shall be unlawful to possess fully automatic firearms while hunting any species of wildlife. Are suppressors allowed for coyote hunting in Alabama? As of October, 2014 it is now legal to hunt wildlife with a suppressor in Alabama. Are there any ammunition restrictions for hunting coyotes in Alabama? There are no specific restrictions. Note: It shall be unlawful for any person to refuse to submit firearms and ammunition or any device, instrument or accessory used in hunting to Conservation Officers for inspection. Is night hunting for coyotes allowed in Alabama? It shall be unlawful for any person to hunt with a bow or gun that has a light source attached that is capable of casting a beam of light (including a laser sight) forward of said bow or gun or to possess such a light source adapted for attachment to said bow or gun while hunting. It shall be unlawful to use any equipment that uses electronics to increase the ability to see in the dark (night vision equipment) to hunt any species of wildlife, both protected or unprotected species. Game animals may be hunted in open season during daylight hours only, except as specified for fox, raccoon, opossum, feral swine, bullfrog and pig frog under seasons. Certain restrictions apply for running dogs during spring turkey season. Can you hunt coyotes from a vehicle in Alabama? It is illegal to concentrate, drive, rally, molest, hunt, take, capture or kill any bird or animal from or by the aid of any automobile, ATV, airplane, train, motorboat, sailboat or any other type mechanically propelled device. Persons may hunt from a floating craft or motor vehicle once the motor is shut off and all forward motion has ceased. It is not legal to hunt from a vehicle on a public road. Can you hunt coyotes with bait in Alabama? Hunting by the aid of bait is illegal in Alabama. It it illegal to hunt any area where baiting/feeding has occurred until 10 days after all bait/feed has been removed or consumed. According to Alabama law, it is illegal to hunt game in any area where baiting/feeding serves as a lure or attractant to game. However, when hunting deer or feral swine on private lands only, there shall be a rebuttable presumption that any bait or feed located beyond 100 yards and not within the line of sight of the hunter, is not a lure or attractant on the area where the hunter is attempting to take deer or feral swine. “Not within the line of sight” means being hidden from view by natural vegetation or terrain features. For questions concerning the “Area Definition”, contact your local conservation enforcement officer or visit outdooralabama.com. Can dogs be used to hunt coyotes in Alabama? Dogs cannot be used to hunt during and in areas of spring turkey season. It is illegal to hunt with dogs during day time or after 3:00 a.m. during spring turkey season. Is there a coyote bounty in Alabama? Not at this time. Note: It is illegal to import, possess, sell or offer to sell live: any species of mongoose, any species of wild rabbit or hare and any deer, raccoon, fox, skunk, coyote, wild turkey, wild rodents and any wild goat, sheep, antelope or other exotic game from any area outside of Alabama. (Also, see Sale of Game Birds and Game Animals, page 45) or any fish from the genus Clarias, Serrasalmus or Mylopharyngodon. This information is for informational purposes only. This website has no affiliation with any department of the above mentioned state. For your own safety please contact your local office to verify the information presented. CoyoteHunting101.com is not responsible for your own stupidity. Coyotes will eventually take pver yhe yhe deer population . An when it does it will b to late . Blame it on ur state when it happens because there just to stubborn to let u hut them at nite . You are 100% correct. Handcuffing our ability to control the predator and hog population is ruining habitat and whitetail population. Just have a look at whats happened on ft rucker for an example. A pure wild boar and predator pit. 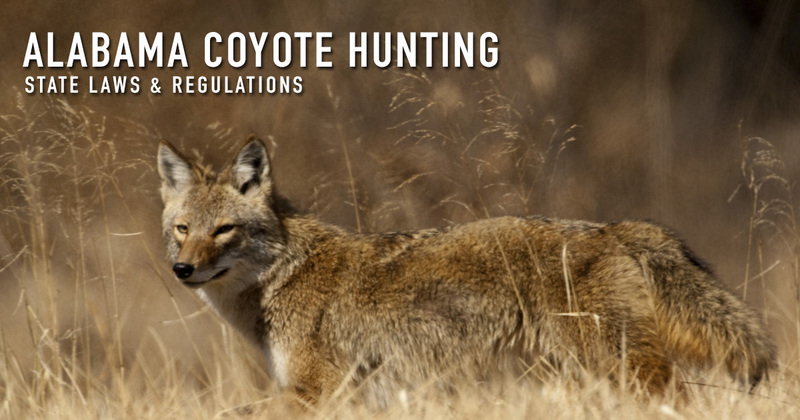 Can a permit be obtained to hunt coyotes at night with night vision equipment? Good damn question. I have tried getting a straight answer to that very question from my local Game Wardens Office and days later, haven’t gotten one yet. But, if or when I do, I will post it here. Per Captain Askew of District 1, a Depredation Permit will allow you to kill hogs and coyote at night over bait using night vision or thermal scopes. Disclaimer: If you live in the city you will need to get permit from City Council before applying for Depredation Permit. To my knowledge it is illegal to discharge a firearm within the city limits of any city in Alabama for any reason except self defense. CONTACT A STATE BAR ATTORNEY BEFORE SHOOTING ANYTHING INSIDE CITY LIMITS OF ANY CITY OR TOWN. can I kill a coyote in Decatur al city limits,if is in my back yard,stalking my cats? I live in Coffee County and can hardly see a deer anymore. The coyotes are thick as mud. Why we can’t hunt with Thermal IR scopes is beyond me!